We fixed fair Scotland’s figured form. Is guardian of their memory. No gale can rend or billow bear. Will soften for the stranger dead. This quiet home in Christian ground. From Cornish Ballads and Other Poems, ed. by C. E. Byles. John Lane: The Bodley Head, 1904, 1908. ‘The Figure-head of the Caledonia at Her Captain’s Grave’, read by Angela Williams. Recorded in the Church of St Morwenna and St John the Baptist, Morwenstow on 30 September 2010. In the early autumn of 1842, the Caledonia, a 200-ton brig from Arbroath in Scotland, was carrying a cargo of grain from Odessa to Gloucester, via Falmouth. On the night of September 7th she was caught in a gale off the north Cornish coast and driven onto the rocks at Sharpnose Point: of her crew of nine only one man survived. According to Hawker’s most frequently quoted account of the incident, published in 1865 in Charles Dickens’ periodical All the Year Round and later included in Footprints of Former Men in Far Cornwall, he was awoken by a young member of his household on 8th September at around daybreak with the news that there were ‘dead men on vicarage rocks’. In this version, written more than twenty years after the event, at a time when he was beset by financial worries and with a growing family to support, Hawker describes the terrible scene in vivid detail: the waters of the bay ‘tossing and seething with a tangled mass of rigging, sails, and broken fragments of a ship’, the billows rolling up ‘yellow with corn’, the bodies of two dead sailors lying ‘stiff and stark’ on the sand, and the frightful way in which ‘ever and anon there came up out of the water, as though stretched out with life, a human hand and arm’. For the reader the horror is mitigated slightly by the fortunate discovery of a lone survivor, collapsed on the ground at a place ‘just where a brook of fresh water fell towards the sea’. Hawker’s description of how, ‘He opened his eyes at our voices, and as he saw me leaning over him in my cassock-shaped dressing gown, he sobbed with a piteous cry, “O mon père, mon père!”‘ is almost convincing: the dressing gown certainly sounds plausible, though it might have presented a significant encumbrance during the climb down the ‘frightful descent of three hundred feet to the beach’. Writing anonymously for a London magazine, without mention of Morwenstow, and with so much time elapsed since the episode in question, Hawker was in fact providing an artistic and somewhat fictionalised version of what actually took place: the survivor, Edward Le Dain, was found not by Hawker as he later claimed, but by a Mr John Adams of Stanbury, and was cared for at Stanbury as well as at the Vicarage. For over a hundred and fifty years the figurehead survived in its position beside the graves, outlasting other similar monuments which had once been a feature of churchyards along the Cornish coast. However, in the autumn of 2004 a detailed inspection revealed serious internal damage caused by rot and decay, and a small team led by one of the UK’s leading conservers of carved wooden artefacts, Hugh Harrison, was commissioned to carry out a complete restoration. 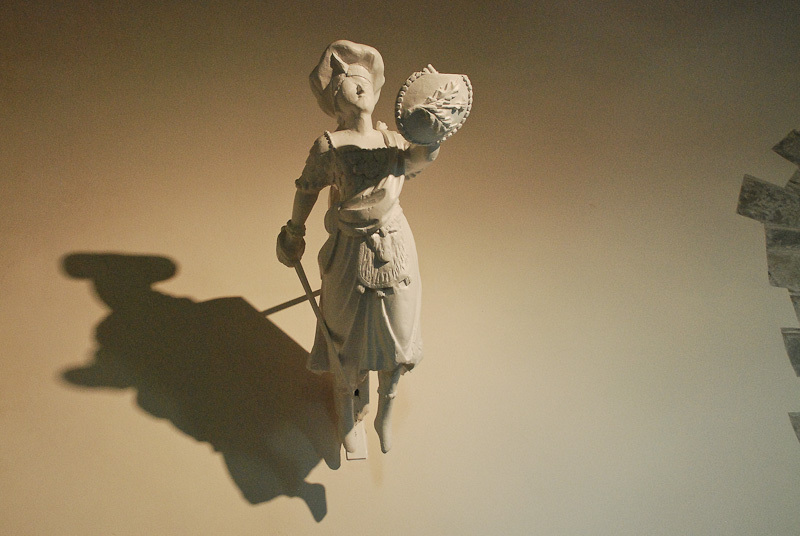 The project took several years to complete and although Morwenstow Parochial Church Council had at first hoped to return the restored figurehead to the churchyard, it was eventually decided that because of its fragility it should be mounted inside the church where it would be protected from the weather. 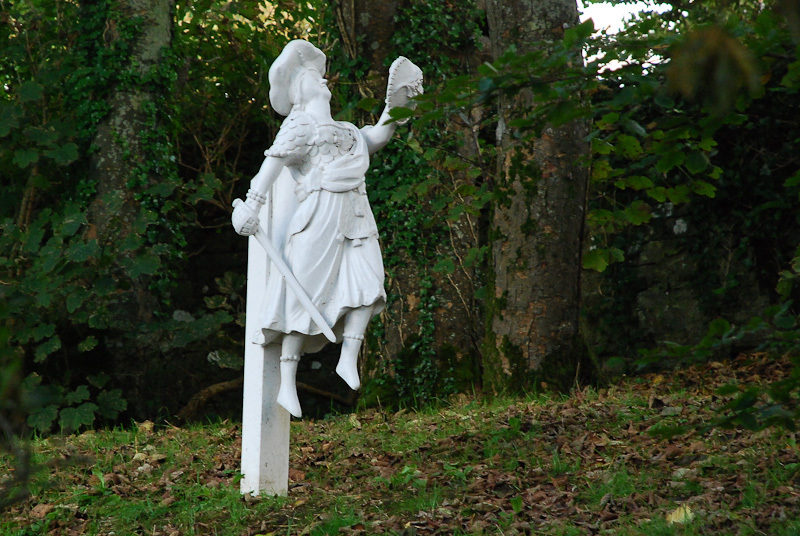 Rod Hare, a specialist craftsman from Tiverton, created a weather-resistant replica identical to the original, and this was installed in the churchyard in 2008. On 7 September that year, the 166th anniversary of the disaster, a service attended by descendents of Hawker and the crew was held at Morwenstow church to dedicate the new marker. Among the congregation was Nicolas Jouault, great, great grandson of Edward Le Dain, whose presence was even more remarkable than it might at first appear, since Le Dain went on to survive two further shipwrecks after his escape from the destruction of the Caledonia. Alongside an imaginative recreation of the crew’s final months at sea and the fatal delays which left them at the mercy of the gale, Treachery at Sharpnose Point: Unraveling the Mystery of the Caledonia’s Final Voyage provides a detailed account of the wreck and its aftermath. The ‘treachery’ implied by the title of the 2001 US hardback edition turns out to be unsupported by Seal’s own investigations (See ‘Wrecks and reputations’, below) but his account of his researches and their sometimes unexpected outcomes provides enjoyable and informative reading for anyone with an interest in Hawker. The Picador paperback suffers from poorly reproduced illustrations and tiny print; better to search out an inexpensive secondhand copy of the hardback at AbeBooks, Amazon or eBay. 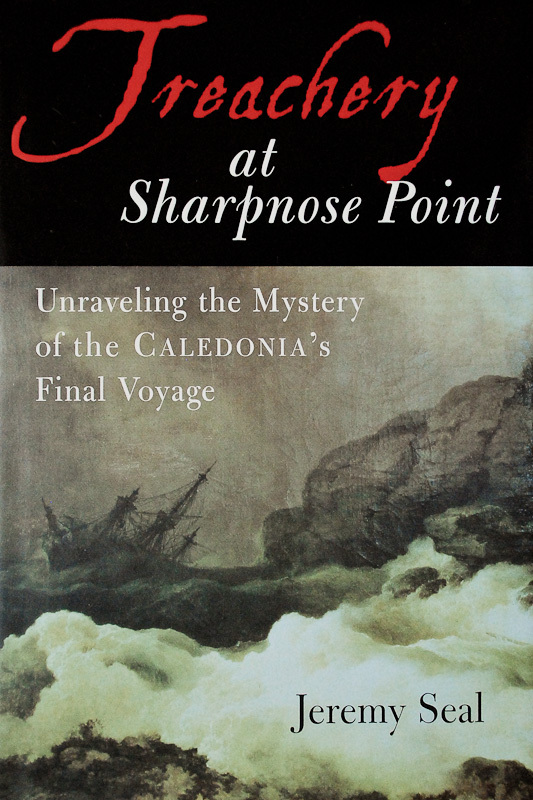 Treachery at Sharpnose Point: Unraveling the Mystery of the Caledonia’s Final Voyage by Jeremy Seal, Harcourt, 2001. ISBN 0-15-100524-9. The Wreck at Sharpnose Point: A Victorian Mystery, was published in the UK by Picador in 2003. Text and photos © Angela Williams 2010, 2011. Sound recording © Tom Williams 2010. This is amazing! I am the English born great great great grandson of Edward Le Dain. I look 4ward to Visiting Sharpnose Point!